Spring cleaning is one of those home rituals that really makes sense. After a season indoors with the house locked up tight against cold, wind and snow and inevitable bits of mud, grit and other nasties dragged into the house, spring cleaning is the way to go. While you’re cleaning your house this spring, throw in a factor that you may not always consider when it comes time for spring cleaning: your allergies. Using allergy free cleaning products not only kills germs, but also cleans up allergens from dust mites, mold spores, beg bugs, animal dander and other allergens makes a whole lot of sense if you really want to do your spring cleaning right. It’s a question of finding home cleaning products that are strong enough to kill allergens and germs yet safe to use in every circumstance around the house. After all, you don’t want to make problems worse by using cleaning products that cause as many problems as they solve. But relax; you really can clean the air and surfaces in your home without using harsh chemicals that might produce sensitivities of their own. HomeFree Cleaning Supplies are scientifically formulated for people with chemical sensitivities, allergies or asthma. HomeFree MultiCleaner is an effective cleaner that is absolutely free of chemicals and irritants that could set you to itching, cause rashes or irritate eczema while you go about spring cleaning. HomeFree Cleaner is plant-based and environmentally friendly, totally nontoxic and noncardinogenic, and contains no caustics, acids or solvents. In fact this product is environmentally-friendly certified under California’s Clean Air Solvents program. HomeFree MultiCleaner won’t harm any surfaces and is 100% biodegradable. That means no residue left over to haunt you for days or weeks. Just clean surfaces, like you like them. This cleaner is strong enough to take on your toughest household projects. At only $11.95 (with a price protection guarantee) per 32 fluid ounces, you get a season’s worth of cleaning power with a spray cap for convenience! When you’ve cleaned up the tops, bottoms and sides of everything in sight around the house, it’s time to move on to the glass surfaces. 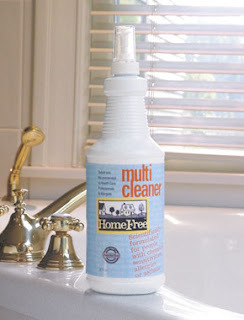 HomeFree Glass Cleaner has all the allergy and chemical free benefits of HomeFree MultiCleaner, and is designed to streak-free cleaning on glass, mirrors, windows and glassware. HomeFree Glass Cleaner is also certified under California’s Clean Air Solvents program, contains no perfumes or dyes, will not stain, and is ideal for people with chemical sensitivities. In between cleanup tasks, life goes on and it always seems like there are dishes to do. Organic HomeFree Dishwashing Liquid is ideal for daily use or for cleaning and putting away the winter glassware and plates and putting them away for the season. People with eczema or chemical sensitivities can safely use this dishwashing liquid based on the same formulations that make organic HomeFree GlassCleaner and MultiCleaner so effective. If you’re seeking a dishwashing liquid that doesn’t use harsh chemicals, yet is strong enough to remove baked on food and other food residues, you’ll love how easy Homefree Dishwashing liquid makes the job of doing dishes in any season. Even the cleanest homes sometimes fall prey to mold and mildew that can crop up when spring rolls around and humidity soars through the roof. Literally! Mold and mildew cleaners can help you tackle buildups wherever you find them. Start with AllerTech Mold and Mildew Stain Remover, tested and recommended by allergists and health care professionals to use anywhere mold and mildew is found. It doesn’t require mixing, and comes ready to spray for use indoors or out, at only $11.95 per bottle. Mold and mildews cause allergic reactions that can make you or your loved ones very sick. 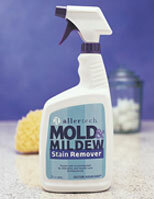 Apply AllerTech Mold and Mildew Stain Preventer and protect yourself from returning mold allergies. We’re getting down to the nitty gritty of spring cleaning and preventing allergies at the same time. So let’s take a look at ways you can nail allergens before they can cause any harm to you and your family. If you’ve never checked out the world of UV Sanitizers and how clean they can get your home right down to the microscopic level, then it’s time you gave consideration to some products that will please you to no end. The CleanWave UV-C Vacuum Cleaner eliminates 99.9% of the detritus and little bugs that cause allergies around the home. That includes sucking up and killing off dust mites, bed bugs, allergens, and even viruses and bacteria. This isn’t “just” a vacuum. It comes equipped with a UV-C (ultraviolet light) feature that essentially breaks down allergens and kills harmful creatures as they come through the vacuum. The two-stage filtration system and easy, bagless design are the inner foundation of a detachable hand vacuum with 400 watts of cleaning power. Positively cyclonic. You’ll love the clean feeling you get using this vacuum on carpets, fabrics, even bedding and bathrooms. The Nano-UV Wand Large Area Disinfection Scanner takes only 10 seconds to kill 99.9% of the viruses that cause colds and flus, eliminates bacteria and mold, and knocks out bed bugs and dust mites. It even kills E-Coli and Salmonella. Are we talking your language yet? This wand is an absolute germ killer that can knock out the pests and causes of allergies and asthma, as well. When spring cleaning around the house is done, there’s an important part of the environment to consider, and that’s the air you breathe. To finish the job of spring cleaning and make your home “spring fresh” all year round, we suggest you look at a Home HEPA Air Purifier. The Normal Room HEPA Purifiers are a good place to start. Each is powerful enough to remove 99.97% of particles in the air. That means pollen, mold spores, and other allergens will be gone. Kaput. Nada. Cleared from the air. Now that’s Spring Cleaning Done Right. All in a one-stop shop from spray cleaners to air purifiers. Have fun cleaning!